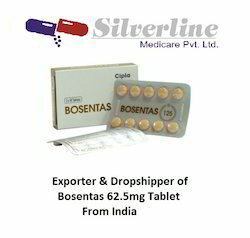 Exporter of a wide range of products which include bosentas 62.5mg tablet, ipravent inhaler, montair 4 mg tab, pirfenex 200mg tablets, pirfenex pirfenidone tablet and pirfenex tablets. This medication is an endothelin receptor antagonist, prescribed for pulmonary atrial hypertension (high blood pressure in the lungs). The medication blocks the effects of endothelin-1 thereby decreases blood pressure in lungs. The medication also inhibits blood vessel thickening. We are engaged in offering our clients a high quality range of Ipravent Inhaler which works by opening the air passages, making breathing easier. This Ipravent inhaler is formulated from the best quality ingredients & advance methodology keeping in mind the set medical norms. 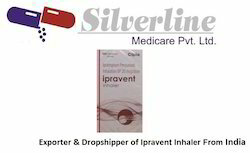 The offered Ipravent inhaler is used to treat chronic obstructive pulmonary disease (COPD), including chronic bronchitis and emphysema. Prevention and long-term treatment of asthma. It is also used in certain patients to relieve allergy symptoms (eg, itchy, runny, or stuffy nose; sneezing) and to prevent asthma attacks caused by exercise. It may also be used for other conditions as determined by your doctor. Montelukast is a leukotriene receptor antagonist. It works by blocking a substance called leukotriene, which helps to decrease certain asthma and allergy symptoms. · Some MEDICINES MAY INTERACT with montelukast. Tell your health care provider if you are taking any other medicines. · Ask your health care provider if montelukast may interact with other medicines that you take. Check with your health care provider before you start, stop, or change the dose of any medicine. 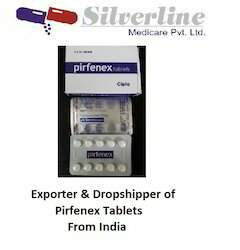 The goodwill we have gained in the market is due to our offered Pirfenex 200mg Tablet. The offered Pirfenex tablet works by inhibiting the synthesis of TGF-beta, a substance which manages various functions such as differentiation and proliferation and plays a big part in fibrosis. Our provided Pirfenex tablet is used to treat idiopathic pulmonary fibrosis, decreasing the symptoms associated with the liver, lung, or the kidneys. 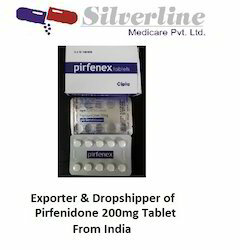 Uses: Pirfenex (Pirfenidone) is used to treat idiopathic pulmonary fibrosis, decreasing the symptoms associated with the liver, lung, or the kidneys. It works by inhibiting the synthesis of TGF-beta, a substance which manages various functions such as differentiation and proliferation and plays a big part in fibrosis. Additionally, it also hinders the synthesis of TNF-alpha which plays an active part in inflammation.Dosage and Administration: Correct dose will depend on the patient`s weight and health, as well as the severity of the condition being treated. Always follow your prescription and only adjust your dosage if advised to do so by a qualified medical professional. 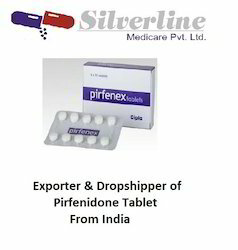 The typical starting dose is 200mg of Pirfenex (Pirfenidone), taken 3 times a day. Dosage can be adjusted by your physician in accordance with progress. It is recommended that dosing is done after a meal or snack. Possible side effects of Pirfenex (Pirfenidone) include appetite changes, an upset stomach, nausea, increased gamma glutamyl, increased AST, itchiness, jaundice, or light sensitivity. If you experience an allergic or hypersensitive reaction, seek emergency medical attention. Possible signs may include skin rashes, hives, difficulty breathing, difficulty swallowing, or swelling of the face or limbs. 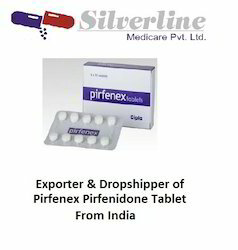 Immediately consult your physician or attend the hospital straight away if you suffer from continued vomiting, dark discoloration of urine, persistent pain in the stomach, a burning sensation occurring in the throat, bruising or any other severe adverse events which have not been referenced here.Pirfenex (Pirfenidone) could trigger elevated liver enzymes, which may lead to liver problems. A reduction of the dosage may be temporarily ordered by your physician if this occurrs. 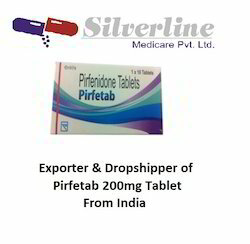 Pirfenex (Pirfenidone) is used to treat idiopathic pulmonary fibrosis, decreasing the symptoms associated with the liver, lung, or the kidneys. It works by inhibiting the synthesis of TGF-beta, a substance which manages various functions such as differentiation and proliferation and plays a big part in fibrosis. 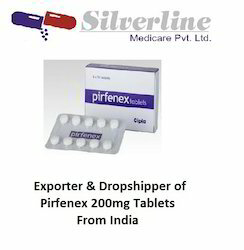 Pirfenex (Pirfenidone) is used to treat idiopathic pulmonary fibrosis, decreasing the symptoms associated with the liver, lung, or the kidneys. It works by inhibiting the synthesis of TGF-beta, a substance which manages various functions such as differentiation and proliferation and plays a big part in fibrosis. Additionally, it also hinders the synthesis of TNF-alpha which plays an active part in inflammation. Correct dose will depend on the patient`s weight and health, as well as the severity of the condition being treated. Always follow your prescription and only adjust your dosage if advised to do so by a qualified medical professional. The typical starting dose is 200mg of Pirfenex (Pirfenidone), taken 3 times a day. Dosage can be adjusted by your physician in accordance with progress. It is recommended that dosing is done after a meal or snack. Looking for Pulmonary Fibrosis and Pulmonar ?